" ... they had proclaimed the good news ..."
"Hence the laity, dedicated as they are to Christ and anointed by the Holy Spirit, are marvelously called and prepared so that even richer fruits of the Spirit may be produced in them. 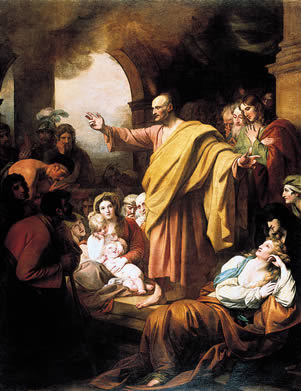 For all their works, prayers, and apostolic undertakings, family and married life, daily work, relaxation of mind and body, if they are accomplished in the Spirit - indeed even the hardships of life if patiently born - all these become spiritual sacrifices acceptable to God through Jesus Christ. In the celebration of the Eucharist these may most fittingly be offered to the Father along with the body of the Lord. And so, worshipping everywhere by their holy actions, the laity consecrate the world itself to God, everywhere offering worship by the holiness of their lives." "...they continued to proclaim the Good News." " ... scattered by the persecution ... "
Just as God's will is creation and is called "the world," so his intention is the salvation of men, and it is called "the Church." " ... the Gentiles too had accepted the word of God"
"The Church is a cultivated field, the tillage of God. On that land the ancient olive tree grows whose holy roots were the prophets and in which the reconciliation of Jews and Gentiles has been brought about and will be brought about again. That land, like a choice vineyard, has been planted by the heavenly cultivator. Yet the true vine is Christ who gives life and fruitfulness to the branches, that is, to us, who through the Church remain in Christ, without whom we can do nothing. THE FOURTH SUNDAY OF EASTER: "I am the good Shepherd." There is a door through which all of us must pass: the door of death which leads beyond this earthly life. Jesus Christ has gone through this door, having died according to the flesh, and he has revealed that death has no power over him because he is Lord of life. He has returned from that journey to tell us the way, to show us how to live so that when we die we need have no fear of death's danger. Again and again he greets us with the words "Peace be with you" after his Resurrection. Peace is ours because all fear is cast out when we place perfect faith in Him who is Life and who gives life. For those who love Him and surrender to His lordship Christ is the door. Whoever departs this world through him will be "safe". How do we enter the sheepfold? Where in the world is the "gate" of which Jesus speaks? Who are the thieves and hirelings of whom we must beware? An ancient saying helps us to find our way: "where Peter is, there is the Church", ubi Petrus, ibi ecclesia. The choice is ours to make. If we are to be preserved from the "powers of death", the curse of those who pass through the "gates of Hades", then we must live in the Church against which the jaws of death shall never prevail. 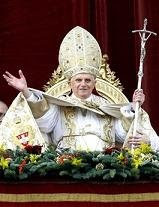 We must surrender to the governance of the Holy Father as to Christ himself: in absolution, doctrine and discipline. The Church, in union with Peter the rock throughout the world, is the gate through which all men go to eternal life. Blessed be God who has given the gift. Now it is up to us to preach and live the truth about the Church, "house of God and gate of heaven", in which we confidently and joyfully look forward to passing safely through the danger of death into the eternal embrace of the triune God. "my Father gives you the true bread"
Faith is the theological virtue by which we believe in God and believe all that he has said and revealed to us, and that Holy Church proposes for our belief, because he is truth itself. By faith "man freely commits his entire self to God." For this reason the believer seeks to know and do God's will. "The righteous shall live by faith." Living faith "work[s] through charity." Divine Mercy Sunday: “Receive the Holy Spirit"
and whose sins you retain are retained. The Apostle's Creed associates faith in the forgiveness of sins not only with faith in the Holy Spirit, but also with faith in the Church and in the communion of saints. It was when he gave the Holy Spirit to his apostles that the risen Christ conferred on them his own divine power to forgive sins: "Receive the Holy Spirit. If you forgive the sins of any, they are forgiven; if you retain the sins of any, they are retained." Monday in the Octave of Easter: "God raised this Jesus"